From time to time my work takes me back to psychology, or at least to psychoanalysis. 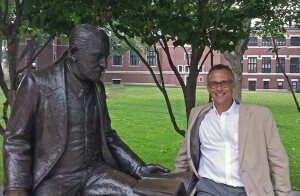 Last week I spoke at Clark University on Sigmund Freud. This was particularly meaningful to me because I often teach Freud’s “Clark Lectures,” and Clark was the only university at which Freud spoke. I even got my picture taken with the Freud statue! I published a review on more mainstream psychological research in today’s Washington Post. The book deals with memory and amnesia, a topic on which I’ve worked over the years. I’ve attached it below. Henry Molaison (1926-2008) lived a long life, but as it turned out, he experienced most of it in a very short time segments. His seizures started early, and by the time he was in high school they had become frequent. Medications to control epilepsy had a variety of side effects, and still they didn’t eliminate the seizures. The terrible blackouts were always a possibility. Wilder Penfield had been experimenting with brain surgery on human patients since the 1920s, sometimes “operating on epilepsy patients while they were awake and conscious so that he could pinpoint the abnormal tissue responsible for their seizures.” Penfield’s work received widespread recognition, and when William Scoville examined Henry in the early 1950s, a surgical option seemed likely to provide some relief to the patient. We can imagine why Henry, then 27, and his parents decided to take a chance. Everyone involved knew that the operation was experimental, even risky. The lobotomy was scheduled. The case defined Corkin’s career and became absolutely crucial for the development of the sciences of memory. Neuroscientists came to understand the “extent to which memory depended on a few centimeters of tissue in the medial temporal lobe” because a surgeon had destroyed those pieces of Henry’s brain. Henry could not care for himself without significant help because he would forget just about everything that was going on around him. But psychologists and neurologists, Corkin first among them, made sure that Henry had a decent life. He would be brought to MIT on a regular basis for batteries of tests. Some odd things here and there seemed to stick in his mind; there was a sense of familiarity about a few people and a few tasks. Most of the time, he was happy enough to be a test subject — not remembering that he had been tested before, time and again, for decades. The explicit retrieval of the past is declarative memory: We are purposively calling up something that we experienced. Through remembering, the brain changes itself as new associations are formed with what is retrieved. Each time long-term memories are retrieved, they are edited — showing “that memory is an ongoing dynamic process driven by life’s events.” Henry’s case revealed how necessary the hippocampus is for this process. For years Henry lived with his mother, and there are indications that their relationship was complex and difficult. But this was not the subject of the neuroscientist’s research. This book informs us that at times Henry was prone to terrible rages and that he even threatened to kill himself, but there is little attempt to see the world from his point of view. Perhaps that would have been impossible; it would certainly have been inconvenient. Corkin acknowledges how important Henry was for her work. She recognizes that “our research with Henry was certainly a boon to my lab’s reputation” and affirms his “limitless worth as a research participant.” But what does it mean to participate without memory? Corkin became Henry’s guardian in his later years and saw to it that he was comfortable and well cared for. She also saw to it that upon his death, his brain was quickly removed from his skull so that it could be studied with all the technology now at our disposal.